See scan - perfect condition. This is an absolutely scarce and rare Bulgarian Socialist / communist period medal issued for the newly established Space astronaut / cosmonaut / astronautical Society in 1982. The medal was issued for the occassion of 25 years since the first space flight with the Russian unmanned Soyuz satelite. The Bulgarian Astronaut Society was established after the first space flight of a Bulgarian cosmonaut - Georgi Ivanov with the Soyuz 33. Only a handful of members of the Bulgarian Astronaut Society including the 2 Bulgarian cosmonauts and some other Soviet USSR Russian spacemen received this decoration. There were also some other highest officials from the Bulgarian Government and members of the Bulgarian Academy of Science that also received this medal. The medal has an etched flying into space rocket at its center. A true space exploration astronauts memorabilia piece. 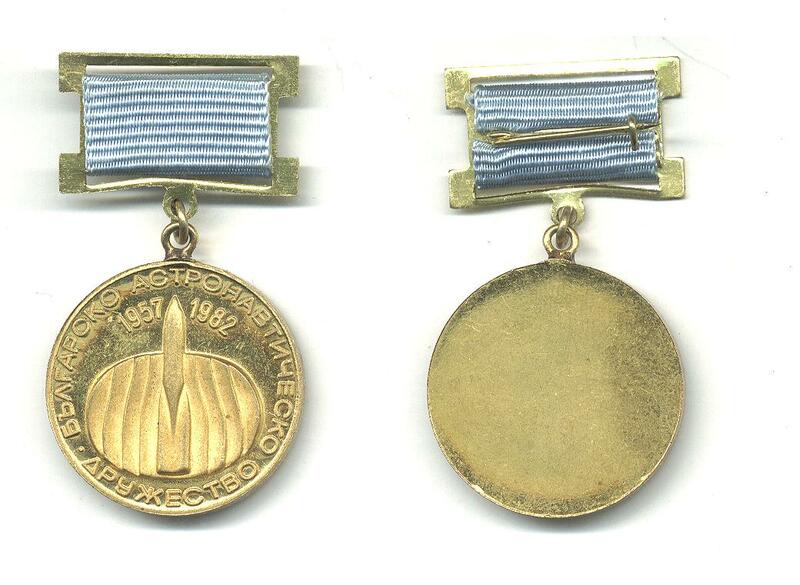 Absolutely scarce militaria / military cosmos collector piece and one of the rare modern Bulgarian medals.